Today, we wish a happy one-year birthday to the rebirth of Disney California Adventure, including Buena Vista Street and, of course, Cars Land. Can you believe it's been a year already since this incredible expansion was unveiled? I've shot this scene many times before, but this head-on angle is not a perspective I've bothered to engage often. But in stumbling across it recently, I thought it'd be worth a shot at processing, and wouldn't you know... it's kind of cool! At least I think it is. The Radiator Springs Racers cars power over those hills on their way around Willy's Butte, and from this angle, it's just a quick glimpse before they zip back down and around. But oh, that backdrop! That spectacular Cars Land backdrop never gets old! 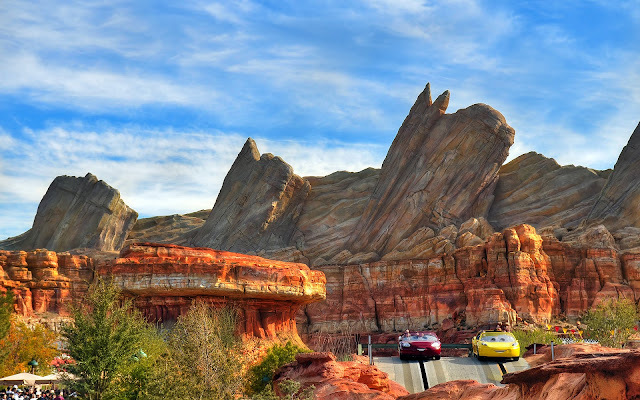 Cars race among majestic rockwork at Radiator Springs Racers! If you like what you see on this blog, do me a favor and check out the Disney Photoblography Facebook page via the link on the left. Go and "like" it and get updates every day a new post is made (which I've managed to make daily for almost a year!) and my favorite blog photos grouped in albums organized by parks and themed lands! Thanks!